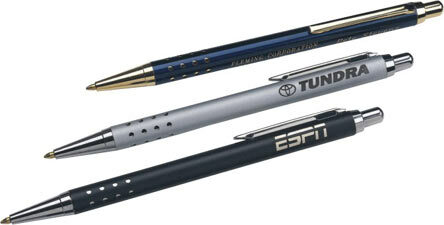 Stylish brass pen available Black and Silver with silver accents and Blue with gold accents. Two line imprint laser engraved on the barrel (maximum 40 characters), is included. Engraving area: 2 1/2" x 3/16". Brass refill is interchangeable with most popular brands. Pencil holds a .5mm lead. Black ink cartridge only. The pen & pencil set includes a deluxe gift box.